The Taverners section of the Vintage Motor Cycle Club managed another spectacular Founder’s Day event at Stanford Hall on July 23 – and this year’s theme, American motorcycles, resulted in some super examples of the Indian marque from the earliest days of the company right up to today’s modern motorcycles that are even giving Harley Davidson a run for its money, writes Ian Kerr. 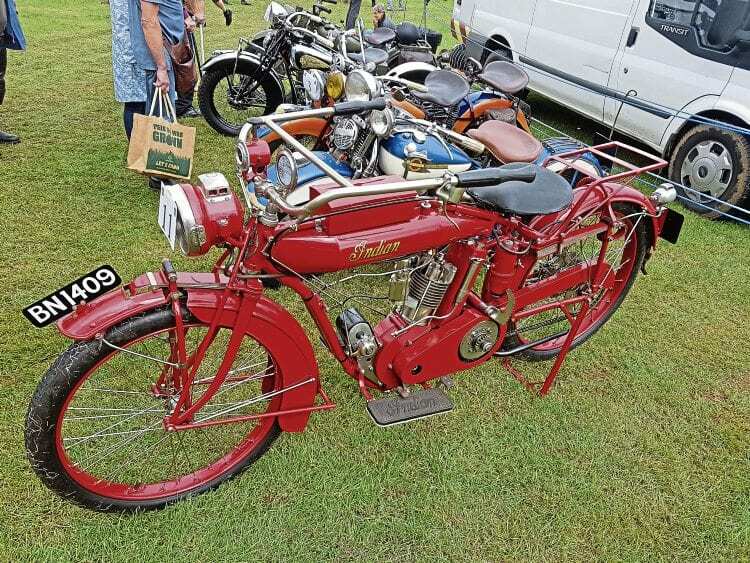 This single-cylinder Indian had all the aura of its larger stablemates – and just look at those bars! and interesting machines that are not usually seen at other shows. In the main arena, action from the section’s trials riding members, who run regular monthly events, demonstrated how slow action can be just as interesting as racing from a spectator’s point of view. The autojumble seems to get bigger each year, and with more grass-roots enthusiasts clearing out their garages, the result is more hard-to-find parts appearing on the market. The rain that had blighted the UK the previous week managed just a brief sprinkle, but nothing like enough to dampen spirits of the thousands of visitors.